I’ve started and re-started this blog countless times. I realized there is no one thing I want to share because there are so many parts of my life. So I dug deep into my heart and thought of Olliewood, named after our beloved dog Oliver. And after many years since Oliver jumped into my life, everywhere I go I am in Olliewood in some way. It’s a place of a lot of laughter and tears too, joy and pain, love and loss, family and friends, my rage against lupus, my passion for animal rescue, and sometimes just random thoughts. I left my career because it no longer brought me gratification and I am looking for a new direction. I lost my soul mate but made a promise to find a new life that has meaning and purpose. That’s not easy. But my world is a jigsaw puzzle where so many different facets come together as the whole. So there are separate sections of this blog depending on what’s on my mind and you can follow what you’re into. I hope you’ll join me on this journey, it's nothing if not colorful. This is kind of a long post but the basic point is, don’t you find it exhausting to pretend you’re feeling ok to people who have shown that they just can’t acknowledge your illness? I do. Back in August it was supposed to be a 5 day trip to see my family and check in with my rheumatologist at HSS (Hospital For Special Surgery in NYC). I brought 2 pair of yoga pants, 3 t-shirts, a pair of sneakers and my 1 year old 3 legged dog. No lie. Eleven weeks later I was still there. When I mentioned to my doctor what I thought was a minor symptom, he sent me straight off to a neurologist, who ran a million tests hoping to rule out “worse diseases than lupus.” Very comforting. Physical therapy twice a week, but to my surprise it really helped. Then off to see a neurological opthamologist — I didn’t even new there was such a thing! — and he found the tiniest defect in my eye that was causing scary problems like double vision, dizziness, and lots of falls. The good news is that I am beyond lucky to have access to this level of health care, and that there was a solution. A very complicated and expensive eyeglass prescription, and things are already better. But all that time, I admit I was scared that something else was really really wrong. So two things happened. (1) I started to feel sicker, because I was not eating the foods I normally eat. I’m not gluten-free but I ate more bread in that time than I have in 2 years. I didn’t cook grains with vegetables and bone broth because she likes to sit at the kitchen counter playing Sudoku which makes it impossible to get to the stove. And I had no access to a car to shop for fresh food every few days like I’m used to doing. (2) I was totally stressed every time I had to step foot into the kitchen. I made some trail mix, a bowl of apples and largely lived off that for a lot of the time. I still had 6 weeks to go. In all that time, no one offered to walk my 1 year old small dog so I could rest. It became a thing to leave my young niece with me all day and night on Saturday AND Sunday while they did their thing. I love my niece and she is a riot, and she was so happy to be spending time with me that I couldn’t say no. But I was freaking WIPED OUT. And no one ever said a word about it. So I spent the rest of my visit doing my best to seem ok. When I was exhausted, I said I was going upstairs to meditate. When my brain was so foggy I couldn’t have a conversation over dinner, I said I had phone calls to make. And when I felt ok, I pulled it together and presented myself as a sort of normal person. I left their house 3 days ago. I can feel the war going on in my body as I fight the exhaustion trying to take over me. I haven’t eaten a healthy thing since I left because I’m too tired to get up and cook something normal. I hope to bring out my beloved yogurt maker tonight and make a batch because that stuff is awesome. But maybe I’ll just get into bed early. So this isn’t my funniest post, but it’s real. Even my indefatigable Jack Russell terrier. @Able_the_3_legged_dog, is wiped out. There’s a family occasion in a month I can’t miss. This time Able and I will take my car so I’m not trapped there. 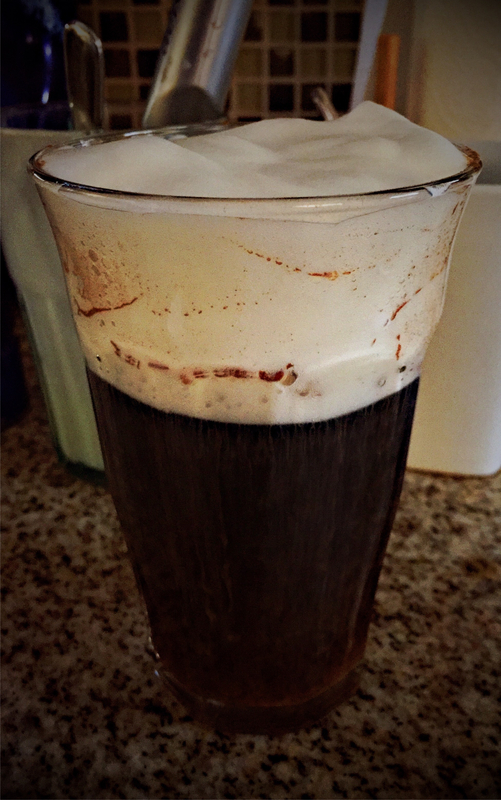 Make a glass of iced coffee. 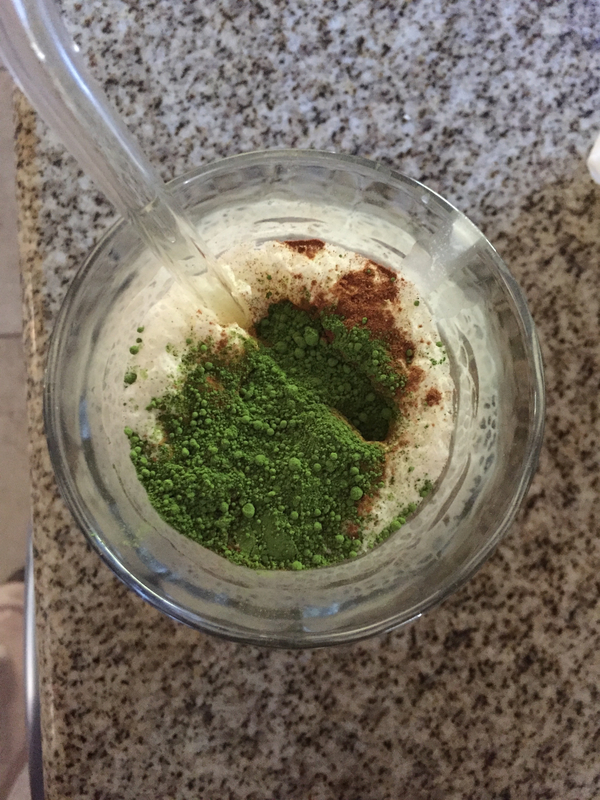 Top with matcha tea (because it’s healthy and gives you energy). Top with cinnamon (because it’s an anti-inflammatory). Use a glass straw (because it’s better than plastic). Settle in. It’ll take your mind off the insipid muzak you are about to hear while you get conflicting answers about what should be simple questions. Saw a couple of friends for the first time in a month tonight. They know I’m taking prednisone, they saw me at the beginning of high dose when the weight piles on like quicksand. I stopped by their house tonight with a big basket of strawberries fresh from the farmers market, and as we caught up (and I sipped water) one of them said, out of the blue, “You know… you don’t look THAT fat. A lot of it is in your face and neck and shoulders.” Because that makes it so much more attractive.